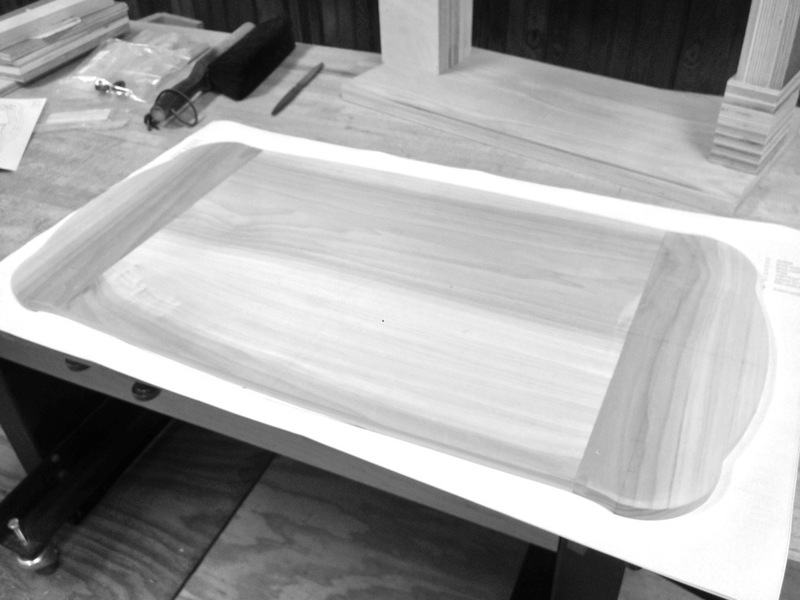 Nearly a year ago, I began building a mini-chevalet to cut the marquetry in the table top. Patrick Edwards, French-marquetry method master, provides a great explanation of a chevalet if you’re unfamiliar with this tool. Essentially, it’s a hand-powered scroll saw mounted on a horizontal rail. Mine is built entirely from scrap 1/2 inch plywood, uses nylon bushings, and fret saw blades. The saw is constrained to move perfectly along this line, with the veneer packet held in a vertical spring-loaded (at least in this version) vise. The advantage to this gizmo is that relatively thick veneer packets can be cut with the guarantee that a piece from one end of the packet will fit into the hole on the other end. We want nice tight joints in marquetry with no gaps between the pieces. The major differences between this version, and a full-sized chevalet are cutting capacity, and comfort. The full-sized model is a sit-down affair with foot pressure controlling the grip of the vise. It’s also capable of working longer pieces as governed by the length of the saw arms. This will be my first introduction to this tool. It’ll also serve as a prototype for when I get around to building a full-sized version. However, there are two limiting factors on that last point: materials, and shop space. The first is easy to correct, it just takes money! While the second point is also solved by money, that solution is vastly more expensive. The design is based off one Don Williams made. I saw pictures of his on the Smithsonian website, and corresponded with him. He graciously provided me with pictures from multiple views. 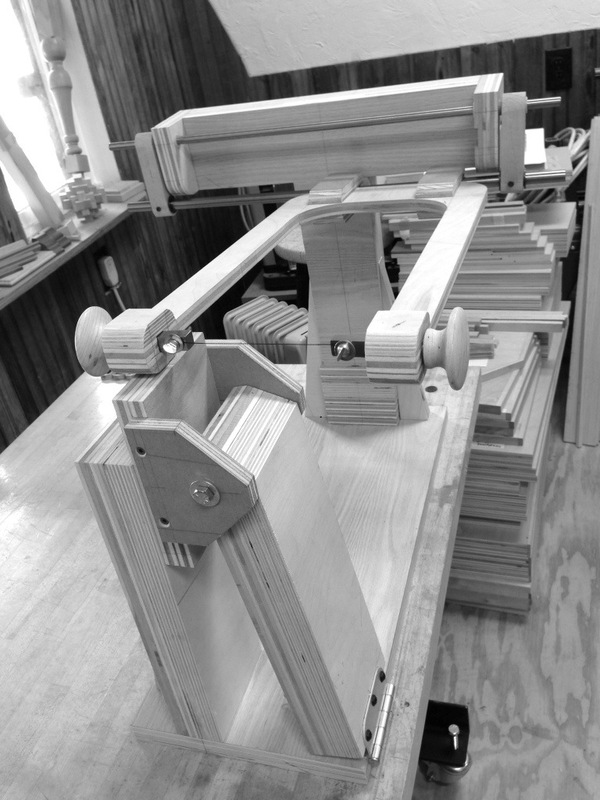 Donna Hill shared more pictures she took at Woodworking in America a few years back. The process has been a great learning experience, and I expect that it will continue to be as I begin using it. Perhaps it’s just me, but I’ve found that very few people know what marquetry is. Marquetry isn’t as prevalent an art form in North America, as say carving. Everybody knows what carving is, but most are unfamiliar with marquetry. Suffice it to say, it’s unlikely you’ll find them on the shelves at your local bookstore. But if you do, please let me know where your bookstore is located. I’d like to visit it! • Silas Kopf offers a DVD which demonstrates the various marquetry techniques. It’s a great accompaniment to his book which provides a historical basis for the craft. Of course if you’d prefer, Silas, Paul, and Patrick all offer classes! 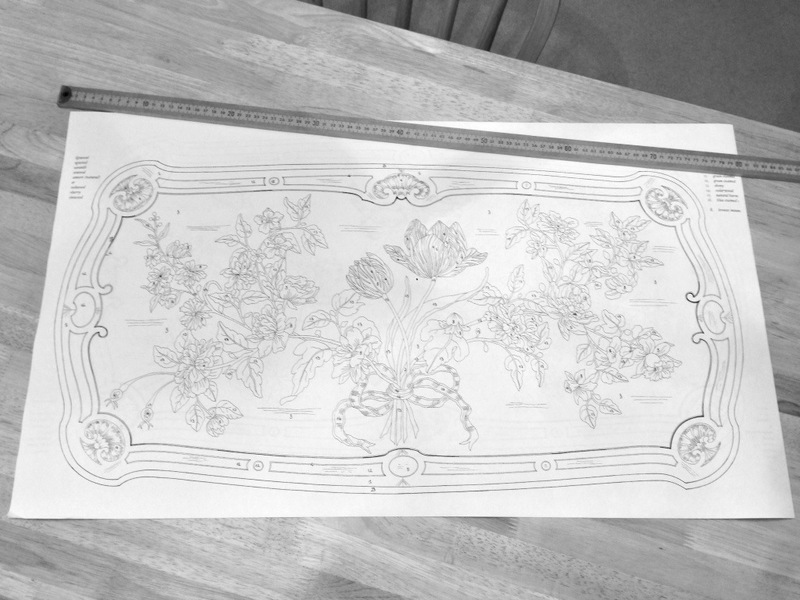 One of the key elements of any marquetry embellishment is the drawing from which it is cut. A few weeks back I managed to make a full-scale photocopy of the table’s top. 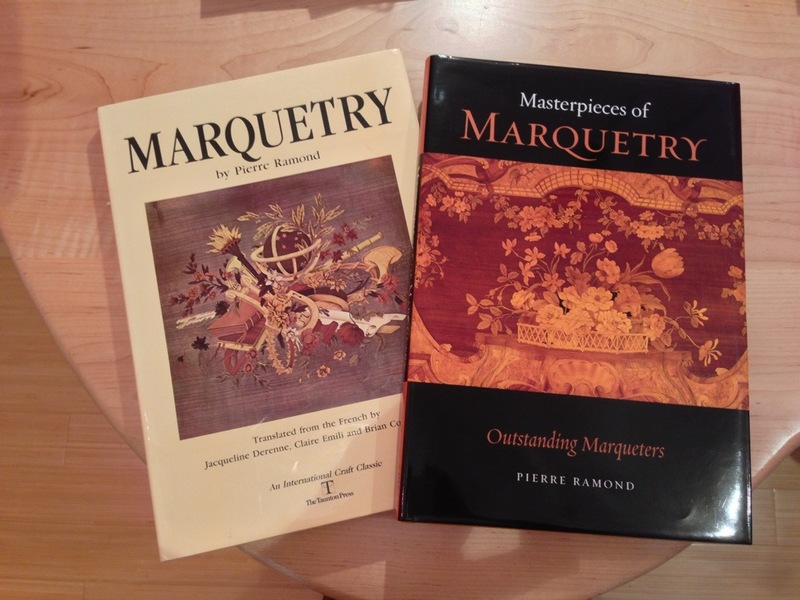 Pierre Ramond’s Masters of Marquetry, vol. III contains a detailed line drawing in reduced form. Luckily, it is printed on a fold-out page that doesn’t cross the spine of the book. Subject matter copied from near the spine always results in distortion! This drawing together with measurements of features in the original top allows computation of a scale (enlargement) factor. These full-scale copies are important because adhered to veneer packets they become the templates from which the marquetry is cut. The table top marquetry is the only portion which will require a chevalet. Parquetry adorning the aprons and interior compartments can simply be cut with a chisel and straight-edge.